Urbanites hoping to better their apartments with space-saving loft beds, elegant glass divider walls or built-in storage compartments are all too often let down once they see what these fantasy furnishings can cost. Those of us who are handy may take the DIY route, but not everyone is a natural Bob Vila. Luckily, there's a happy medium between purchasing pricey new furniture and starting from scratch - IKEA hacking! This resourceful practice involves taking IKEA pieces (preferably ones you already own or got secondhand) and taking advantage of their modular nature to transform them into your dream configurations. 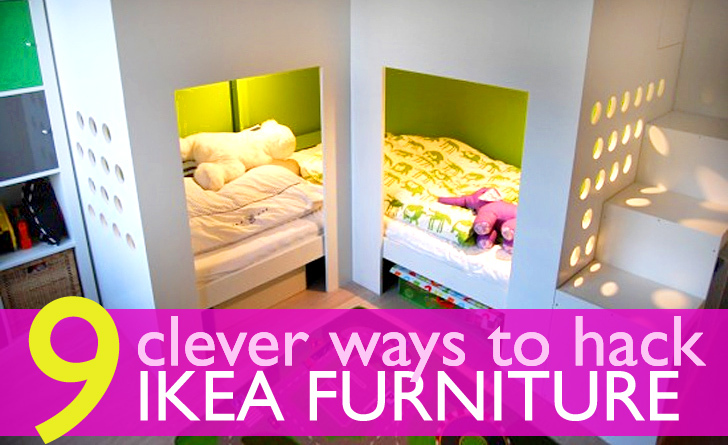 Read on for some of our favorite tutorials seen at Ikeahackers. Have an awkward bit of space between your wall and a refrigerator or other appliance? Transform it into a slide-out utility drawer using a Laiva bookcase and some side panels! A freestanding bar or countertop can divide up a small living space and add functionality that can be accessed from both sides. This DIY bar table is made from an Expedit bookshelf and offers storage as well as style. IKEA hacker Jules decided to modify the Kura bed into a lofted sleeping area for his son. The resulting piece allows the space below to be utilized almost as if the bed wasn’t there at all. Formal dining areas are oftentimes just not possible in tiny apartments, which is why we love this DIY dining nook by IKEA hacker April. Using two Expedit bookshelves, April created a cozy L-shaped bench for dining that does double duty as a storage area. Divvying up a studio apartment into living and sleeping areas without blocking daylight from windows can be a baffling task. This smart IKEA hack reimagines beautiful frosted glass PAX wardrobe doors as a translucent divider wall that can be opened or closed for full privacy. Kids who grow up in the city often have to share a bedroom, but they won’t mind as much with this cozy DIY bed nook. It boasts both a fort-like space underneath and a second play area above. Not having a bathroom wall is a pretty rare issue, but this hack that uses REKTANGEL vases to create a divider can be applied to living rooms or other areas just as easily. As an added plus, the vases can be arranged in a curved configuration if need be and the spaces between them allow light to pass through while still providing privacy. Storage beds can be costly but here’s a way to get one for the price of a Malm dresser (which can be purchased secondhand on Craigslist) and some lumber. And if just one IKEA hack for your apartment isn’t enough, how about taking some inspiration from Steve Sauer’s ingenious micro apartment with 8 different living areas in 182 sq. ft. of space! The studio features all kinds of innovative uses for IKEA pieces from cut-up shelves and tabletops in the kitchen to countertops as floors. It's a play on this use of hack: "a usually creative solution to a computer hardware or programming problem or limitation." Don't be so literal. Life is too short to stress out over such trivial things. Great ideas ...just what I've been searching for !!!!! IKEA hacker Jules decided to modify the Kura bed into a lofted sleeping area for his son. The resulting piece allows the space below to be utilized almost as if the bed wasn't there at all. Kids who grow up in the city often have to share a bedroom, but they won't mind as much with this cozy DIY bed nook. It boasts both a fort-like space underneath and a second play area above. Not having a bathroom wall is not really a common issue, but this hack that uses REKTANGEL vases to create a divider can be applied to living rooms or other areas just as easily. As an added plus, the vases can be arranged in a curved configuration if need be and the spaces between them allow light to pass through while still providing privacy. Storage beds can be costly but here's a way to get one for the price of a Malm dresser (which can be purchased secondhand on Craigslist) and some lumber. And if just one IKEA hack for your apartment isn't enough, how about taking some inspiration from Steve Sauer's ingenious micro apartment with 8 different living areas in 182 sq. ft. of space! The studio features all kinds of innovative uses for IKEA pieces from cut-up shelves and tabletops in the kitchen to countertops as floors.